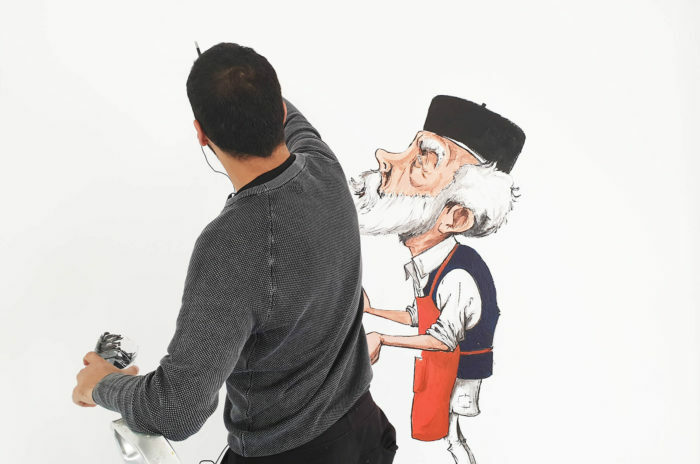 as a part of "travelling narratives"
The residency of the Libyan British cartoonist, Suhaib Tantoush, is part of travelling narratives, a regional program of art and research that aims at encouraging interactions between cultural operators in Morocco, Algeria, Egypt, Mauritania and Libya. Suhaib Tantoush seizes this opportunity to expand his ongoing research and develop his artistic project. The latter tackles different problematics that take as a starting point the Libyan social context, such as: social and legal codes of land ownership in Libya and their psychological and social effects, undocumented events, the relation held by Libyan citizens towards the green book, as well as the situation before and after the revolution. The artist also intends to nurture his work by carrying out street interviews with passersby, in Morocco, and by researching events that are similar to the ones experienced in Libya. His works will be presented during a group exhibition, at Le Cube -independent art room. The exhibition, The Green Book, is a proposal by Tewa Bernosa, founder and director of the WaraQ Art Foundation, Libyan partner organization in the project travelling narratives. Suhaib Tantoush is currently the artistic director of the foundation. Travelling narratives is supported by AFAC – The Arab Fund for Arts and Culture, the Goethe-Institut Marokko, the Institut Français du Maroc, the Centre Jacques Berque, and the ministry of Culture and Communication in Morocco. The program is carried out in partnership with the Townhouse Gallery, مؤسسة ورق للفنون – WaraQ art foundation and the cultural space Diadie Tabara Camara.